Maris Sidenstecker II (M2) is co-founder of Save The Whales, founded in 1977. She designed a T-shirt at the age of 14 to save the whales after reading how they were slaughtered and has carried the passion of protecting marine life throughout her life. 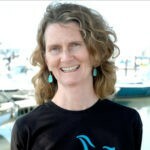 She developed and implemented hands-on interactive classroom programs for school children and has educated over 306,000 students about protecting the fragile oceans and the life within it. As a student, she assisted with field research on orca pods in Washington State and British Columbia. M2 is also an accomplished artist and followed up her original T-shirt with other designs. B.A. double major in Marine Biology/Zoology from Humboldt State University, California. Awards: Educator of the Year award in 2007 from The Monterey Bay National Marine Sanctuary and Association of Monterey Bay Area Governments (AMBAG), 2009 Member of The Year by Madison Who's Who.